It's time to stop just sitting around waiting for something to happen and DO SOMETHING! 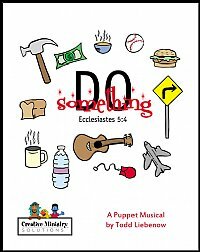 With this 20-minute musical, you'll send your audience to the Believer's Job Placement Center, run by an overworked angel named Dennis. He has lists of people with needs in their lives, but not enough new recruits to get the job done. The problem is there are too many people who see the need and ask, "God, why don't you do something about that?" But he didâ€¦he made YOU! Dennis gives new recruits a presentation about people in the Bible who saw a need and did something about it. Then, he looks at several modern cases of believers who are making a difference in other people's lives.